I would have a picture of another gorgeous guy named Skyler but he was mysteriously missing during the sunset cocktail. Next up, I was tortured by a visit from my sister. 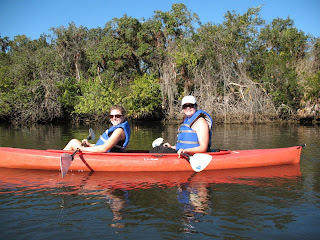 We ended up kayaking and seeing the manatees up close and personal. I took the long way around but you get the idea. I have had a crazy month and the idea of cooking for just myself just didn't appeal to me. I was torn between two Pinterest recipes any way. They both sound awesome so here you go! I hope you have better luck getting them made. In case you are feeling sorry for me, I have since made the roasted chicken several times. I can see these on the menu sometime soon. 2. Add Marsala wine and reduce by one-third. 3. Add remaining ingredients, reduce by half of the original volume. 5. For Penne Rustica: Saute pancetta or bacon until it begins to brown. 6. Add butter, shallots, and shrimp. 7. Cook until shrimp are evenly pink but still translucent. 8. Add chicken, salt, pepper, and mix thoroughly. 9. Add gratinata sauce and 1/4 cup parmesan cheese. 10. Simmer until sauce thickens. 11. In a large bowl, combine shrimp and chicken mixture with the cooked pasta. 12. Pour into a large casserole dish or roaster. 14. Bake at 475 degrees for 10 to 15 minutes. Good luck and if you try either tell me how the turn out! Love the pictures and update on what you've been doing! I will be making that penne with balsamic - looks delicious! What did we do with our time before Pinterest came into our lives? Megan, you crack me up! That does sound like a tough life. I thought you were serious with the Alligator Penne. Wonder if there is such a thing.